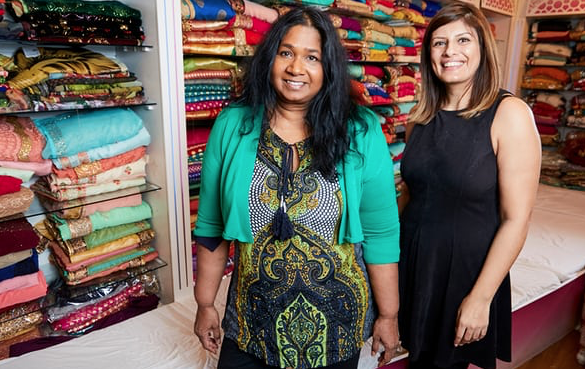 There used to be a time when when it was a usual sight to see Asian women dressed in a sari on a daily basis doing their usual day-to-day activities, such as shopping for groceries or household chores. As time has passed, it is more than likely that you'll see an Asian woman in the UK dressed in a more “comfortable” western attire, only choosing to drape a sari on special occasions such as attending a wedding. Mostly the older generation of South-Asian women still continue to wear a sari as their preferred choice for daily wear. In 1977, Alankar House of Sarees first opened in Manchester in 1977 by Gokuldas Modha, who later went on to open another store in Leicester, Anokhi House of Sarees. His granddaughter, Poonam Modha, 34, has been dedicated in running the family business. The play, Handlooms, directed by Alan Lane, tells a tale of a mother and son who disagree about the way to deal with downfall in their sari business. One can experience the play Handlooms at Alankar House Sarees in Manchester until 24th March, and then at Anokhi House of Sarees in Leicester, from 10th- 22nd April.